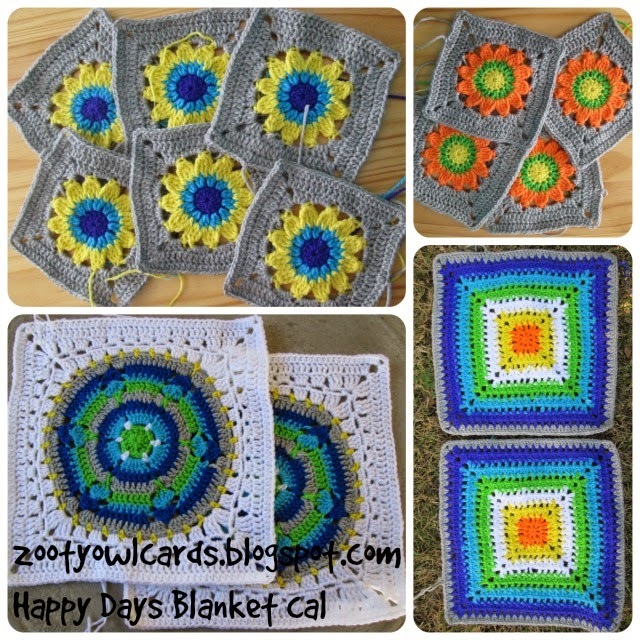 Welcome to Part 4 of our Happy Days Blanket Crochet Along! Some colourful photos sent to me by a few of the lovely CAL ladies! This weeks square is my version of a solid granny square. We will be making 10 of these 14cm x 14 cm squares. Row 2: 3ch (counts as 1dc), 1dc, 3ch, 2dc into same place as sl st; [1dc into each of next 2dc; (2dc, 3ch, 2dc) into next dc] x 3; 1dc into each of next 2dc; sl st into 3rd ch at start to close. Break off yarn. Row 3: Join yarn in top of any dc; 3ch (counts as 1dc); [1dc into each dc; (2dc, 3ch, 2dc) into corner 3ch sp] repeat until you are back at the start; sl st into 3rd ch at start to close. Break off yarn. Rows 4 and 5: Repeat the instructions for Row 3. 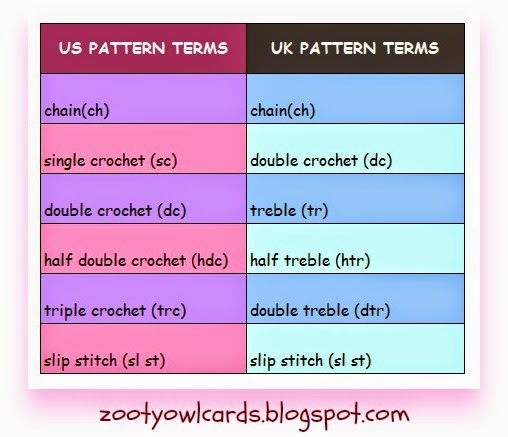 Row 6: Join yarn in top of any dc; 1ch (counts as 1sc); [1sc into each dc; (2sc, 2ch, 2sc) into corner 3ch sp] repeat until you are back at the start; sl st into 1ch at start to close. Break off yarn. Row 7: Join yarn in top of any sc; 1ch (counts as 1sc); [1sc into each sc; (1sc, 1ch, 1sc) into corner 2ch sp] repeat until you are back at the start; sl st into 1ch at start to close. Break off yarn. Join the Solid Granny Squares to the Sunny Flower Squares using the VISIBLE JOIN METHOD to make bigger squares (28cm x 28cm = 2 Solid Granny Squares and 2 Sunny Flower Squares). I was going to do the Saturday Morning Square this week - but thought it would be fun to rather start joining the smaller squares. 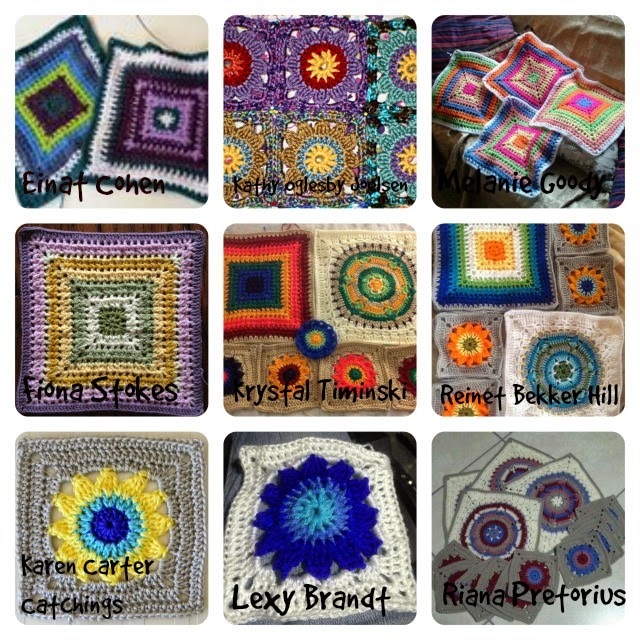 The pattern for the next square will be posted on Friday, 5 September 2014.
nice to see them joined and the end results. Gorgeous. Lots of lovelyness ..... super colour combo's .... a fun CAL! Joining....first I've seen of this CAL but so far the squares are absolutely gorgeous. Time to play catch up...lol. Thank you for doing this CAL!!! Love this, great use of colour! Granny squares are my favorite & you have so may, this is on my list! I would love to have joined in on this , but I have far too many WIP's as it is..